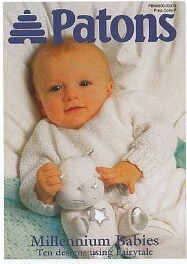 This Patons Millennium Babies Knitting Patterns Book number 379 has ten gorgeous designs created using Fairytale 2ply, 4ply, or double knitting yarn. As with all of our pattern booklets, this item is not returnable. The booklet has designs in three different sizes: 0 to 3 months, 3 to 6 months, 6 to 12 months (M).